Thanks for the Memories: Graduation Season, Here We Come! Ahh, springtime! Amidst the bounty of sunshine and flowers, this colorful time of year isn’t just the ending of winter and beginning of spring – it also marks the ending of an old chapter and beginning of a new chapter in the lives of many people, namely students. Whether in high school or college, graduation season starts in the spring for students throughout the country, and it’s most definitely a very exciting time. Some teenagers will be leaving high school and entering the exciting new world of college while some young adults will be parting ways with adolescence and preparing to enter the work world post-college. Spring marks a time of change and renewal (after all, we do have spring cleaning, right? ), and the new chapter in life it brings to students is one that should be celebrated. Graduation season parades teddy bears, lots of flower bouquets, leis, and many hugs and kisses. Parents and family members alike really put in effort to congratulate their fellow graduate on a job well done. The academic years of high school and college require much hard work and devotion, but also contain some fond memories and lessons in growing up, being responsible, and being independent. Once a student leaves one level of education for the next, there is no going back – the only way to do so is through remembrance of those years. If you’re in the market for a one-of-a-kind gift that your graduate will cherish for time to come, consider a gift that will mark his past efforts and memories while allowing him to celebrate the progression onto the next chapter in life. Our personalized graduation gifts come from the heart and really highlight the personal achievement of your graduate in mind. Help him remember those years with some of your suggestions. Very finely crafted and elegant in appearance, this crystal paperweight is an excellent gift choice for a graduate. 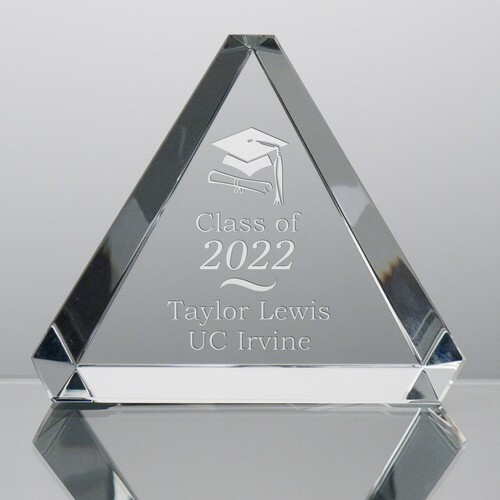 Laser engraved with a graduation cap and scroll logo, the personalization on this item is made complete with the graduate’s name, graduating year, and university name. This paperweight functions to hold important documents or files down on a table while acting as a decorative piece for any desk. It is sure to be cherished by any graduating recipient for years to come! Books and notebooks don’t vanish once the caps fly in the air. Keep memories of academic success close to heart post-graduation while keeping necessary reading material and documents organized with these elegant jade glass bookends. 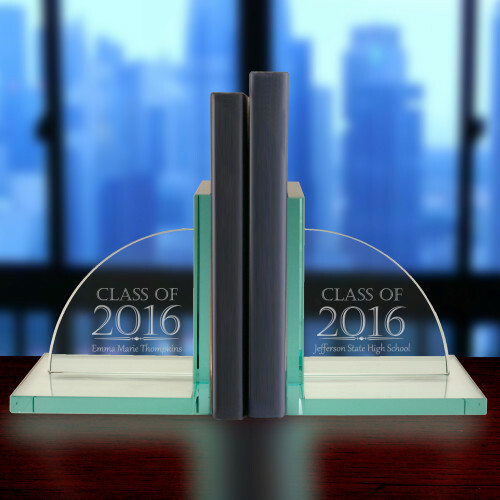 These engraved bookends are perfect for any home desk and will keep necessities within reach to keep your expected graduate geared towards continued success in the work world. 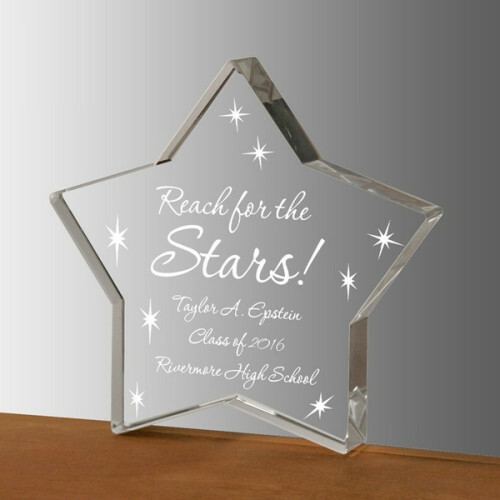 Full of encouragement and optimism, this crystal star-shaped plaque features the phrase “Reach for the Stars!” to represent the bright future of opportunities ahead for your graduating recipient. Shaped to portray the “star” of your family on graduation day, this engraved gift is absolutely fitting as a graduation gift idea. This item features customization of the recipient’s name, graduating class year, and school name. Proudly display the memories of graduation with this beautiful diploma picture frame. This item features a mock diploma which bears the message “I hope your dreams take you to the corners of your smiles, to the highest of your hopes, to the windows of your opportunities, and to the most special places your heart has ever known,” and is designed for you to personalize the certificate with your graduate’s name and “sign” your name at the bottom of the certificate. The frame features room to eventually place in a family photo from graduation day at the top, making it perfect to honor the memories and feelings of accomplishment on the big day. This graduation season, don’t miss on the best in personalized gifts for graduates. Go beyond the flowers, teddy bears, and balloons with our selection of customized graduation gifts, which hold something for every kind of graduating student in mind. Congratulations and good luck to the Class of 2013 from all of us here at MemorableGifts.com!